I'm pleased to announce that my first self-published pattern is available on Craftsy! 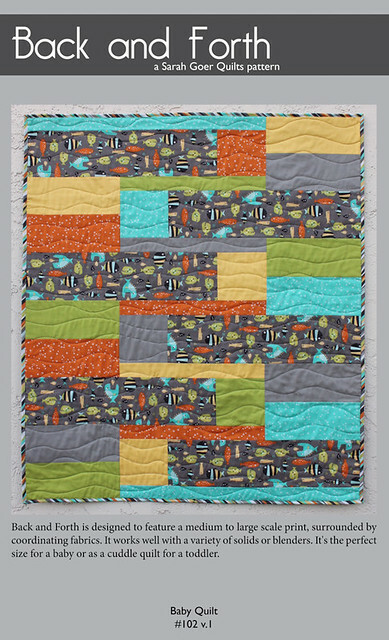 Last Fall, I designed the Zoom Zoom quilt that I gave to our 4-year-old friend who had just become a big brother. 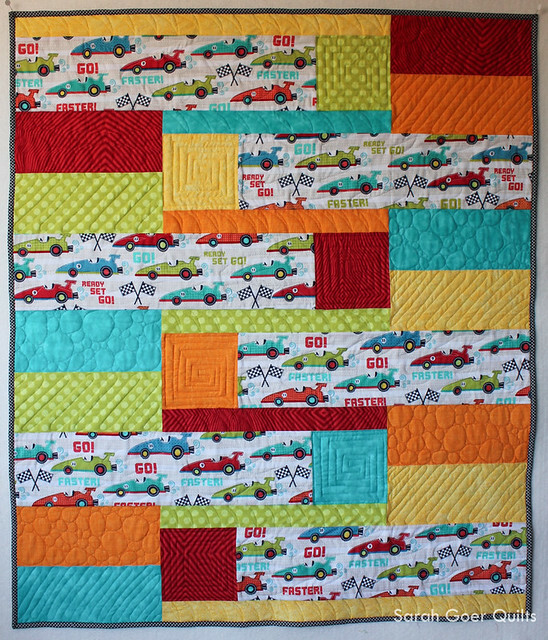 The race car fabric was from my stash and I designed the cuddle quilt to feature the fun print. From that design I created the Back and Forth baby quilt pattern for you. 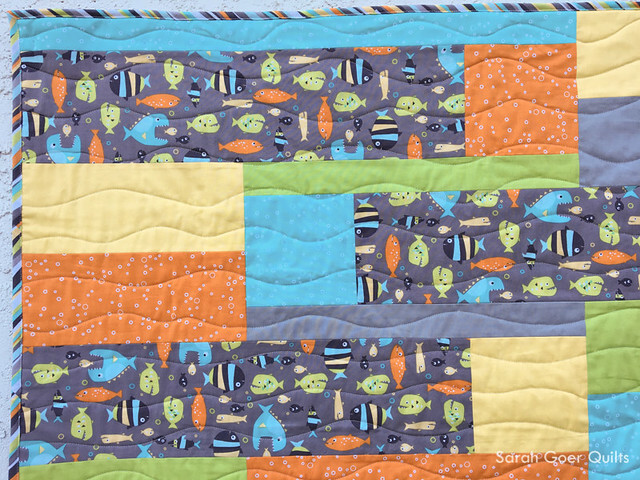 This new version features Guppies for Lunch by Michael Miller Fabrics and coordinating Kona Solids. It would also be lovely featuring a different novelty or floral print. 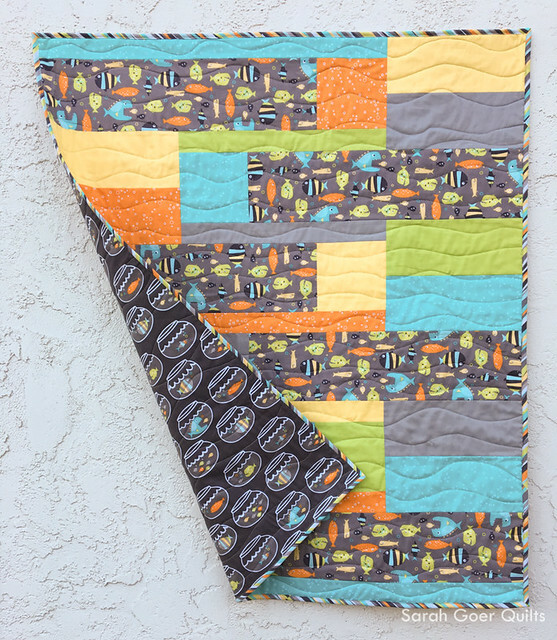 The Back and Forth baby quilt pattern is designed to feature a medium to large scale print, surrounded by coordinating fabrics. It works well with a variety of solids or blenders. It's the perfect size for a baby or as a cuddle quilt for a toddler. The quilt goes together in a day and the instructions are thorough enough for you to easily complete this quilt with no prior experience sewing partial seams. The pattern includes quilting ideas as well as instructions on creating straight and bias binding. The quilt finishes at 35 1/2" x 41". Consider using my machine binding tutorial for a super fast finish! 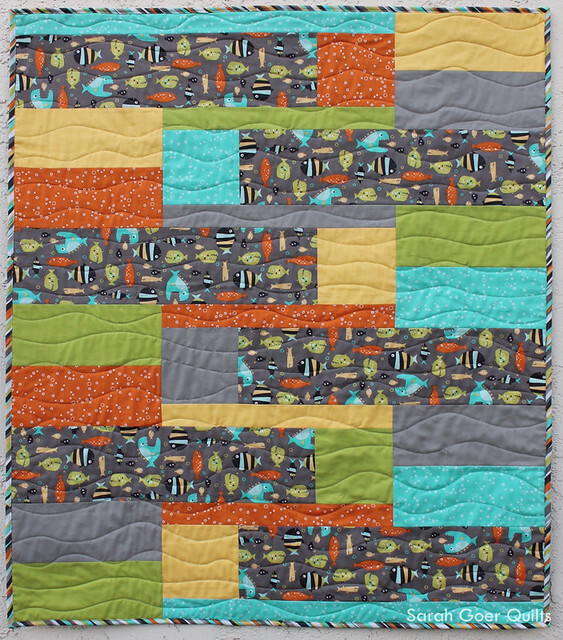 Below are my original Zoom Zoom quilt and the Kaffe version that Laura created when she tested the pattern. 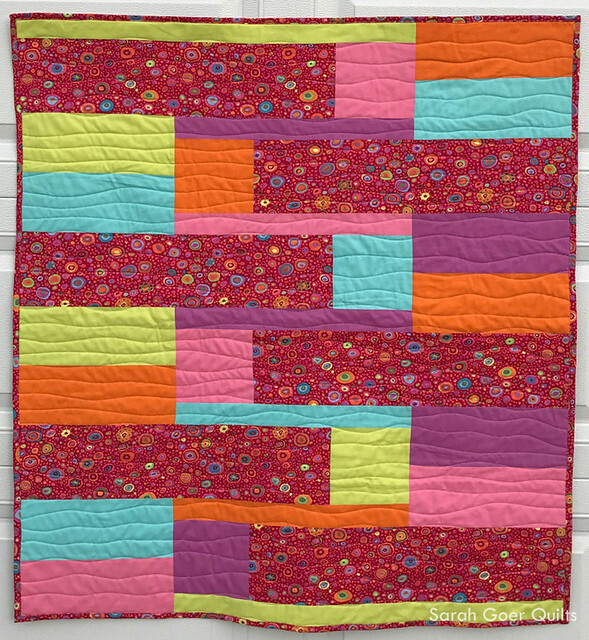 The Back and Forth baby quilt pattern is available in my Craftsy store for $10. Posted in Quilting. Tags: baby quilt, baby quilt pattern, Back and Forth Baby Quilt, designed by Sarah Goer, quilt pattern, Sarah Goer Quilts on October 24, 2017 by sarah. Congratulations on your first pattern release, Sarah. I'm sure there are many more to come as well! This was such a fun quilt to make! The larger cuts of the focus fabric allow it to shine. I know my version is bright, but the new mom loved it! Thank you for a great pattern. Thank you, Laura! I'm so glad she loved it and that you enjoyed my pattern. I purchased this pattern from Sarah and started cutting fabric right away. The pattern is so clearly written, and I love the clean graphic design of both the quilt and the pattern. I can't wait to try making bias binding with the tutorial in this pattern. Great job, Sarah!!! Thank you so much, Mary! I'm so excited to see what you create! Congratulations on the pattern! A great way to showcase a large print. Thank you, Anja! I'm itching to make it with a bold floral.